Elite Serum Rx - Extra Strength - Defend. Protect. Rejuvenate. Elite Serum Rx is the latest and most potent and efficacious formula in the Elite Serum Series of cosmeceutical eye serums made by SkinPro. The orignial and award-winning Elite Serum is the perennial #1 Best Seller overall in the Eyes category on Amazon. The new Elite Serum Rx is rated Extra Strength, due to the high concentration inclusion of Pentapharm's new SYN-TC and Lipotec's Inyline peptides in the formula. Another notable improvement is that the product viscosity mimics a rich eye cream, yet it maintains the cosmetic properties of a completely oil-free and non-comedogenic serum. Elite Serum Rx was developed by SkinPro in conjunction with Cosmetic Pharmacist Irwin Grams. Scientifically designed for the reduction in the appearance of Fine Lines, Wrinkles, Dark Circles and Puffiness around the eyes. This version also features improved ergonomics with the 2nd Generation Dispensing Syringe for precision application. 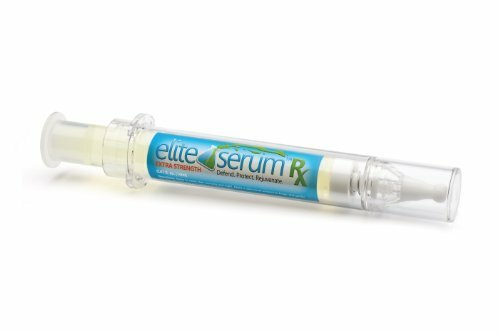 The development of Elite Serum Rx (Extra Strength) combines years of dedicated scientific research and development by a world-class team, which includes cosmetic pharmacists and research chemists. Never before has such a single-purpose cosmeceutical been so potent that the most respected cosmetic surgery medical journal in the world, Plastic Surgery Practice, praised its efficacy in an unsolicited editorial. For the first time ever, ordinary skin care consumers can experience and enjoy for themselves the benefits of an eye serum that works in areas where Botulinum Toxin injections can not reach. Elite Serum Rx has been recently called a "Fantastic Product" by Centerchem, the global leaders in commercialization of new skin care technologies. As with all SkinPro products satisfaction is guaranteed. Elite Serum Rx has earned the Pharmacist Tested Seal of Approval. I was very excited to get to try this Elite Serum Rx Extra Strength by Skin Pro. I had been using the regular strength elite serum Rx and was enjoying the benefits when I was offered the Extra Strength version. It arrived in a very nice box, which I think would be ideal for gift giving. I like that it is also in the syringe dispenser, it works well for me and allows me to use very little at a time, so none goes to waste. I love the consistency of this serum. It looks like it will be an oil but it is not at all oily and actually absorbs like a cream. I use this serum all around my eye area and can see visible results in the difference of my skin texture, brightness, color and overall condition. I am very pleased with the results and I will continue to use it daily. I recommend it!